If your hair looks thin and flat, it is a cry for help. A volumizing shampoo might be the right pick-me-up potion for your hair. These shampoos help make hair really bouncy and voluminous. Finding the best volume shampoo online can be a tough task, since the market is so crowded with many different kinds of shampoos and other hair care products. To help you out, we have created a compilation of the ten best volume shampoos available on the market. The products were chosen based on their overall ratings and user reviews. This is a vibrant shampoo from Herbal Essences, containing the natural goodness of citrus extracts. Like all citrus fruits, this shampoo is packed with the nourishing power of Vitamin C. The scent of this shampoo deserves a special mention for its vibrancy and freshness. 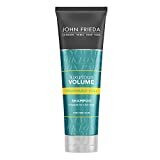 It has the ability to add considerable volume to your hair in just a single wash. For improved results, you can try using it with the special volumizing conditioner sold separately by the same brand. The shampoo lathers well, leaving behind a lush hair. Plus, you only need a small amount for one use. Infused with Citrus extract and Ginseng. Scented by mint and fruits. Add volume with this silicone-free cleanser. Limp, fine hair has luxurious body. Tip from the Fekkai Salon: Use your fingers to massage scalp for the ultimate, invigorating experience. Mix it up by alternating with other Fekkai shampoos. This is another volume shampoo infused with the natural power of citrus fruits. Along with the goodness of oranges and lemons, this shampoo has the added benefit of ginseng extracts. It has a very fruity and refreshing scent, and we could easily identify mint as one of the key ingredients. The shampoo will add new life to limp hair, without making it bulky. It doesn’t contain any silicon, and it is very luxurious and invigorating. It also helps nourish your hair without using any harsh chemicals. This is a very gentle shampoo that cleanses your hair and head, while adding generous volume and body to your hair. It can also help rein in frizziness and avoid flyaways. Your hair will become stronger, shinier, and more manageable with this Kenra shampoo. This is a color-safe product, which makes it an excellent choice if you’ve used dyes or color on your hair. To create body and nourish your hair, this shampoo uses proteins and Vitamin B5 in the form of panthenol. The fragrance is also very soft and gentle, and smells great. INSTANTLY THICK, VOLUMINOUS HAIR - FIRST USE! Tired of battling limp, flat, fine or thinning hair? 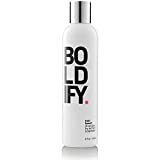 Boldify's powerful hair thickening shampoo instantly absorbs deep into each shaft, nourishing, strengthening and promoting thicker, fuller, softer hair with ABUNDANT VOLUME with just one use - making it the best shampoo for thin hair if you want fast results. REDUCE LOSS, PROMOTE GROWTH: Extra Concentrated Aloe Vera, Rosemary Extract, vitamins and minerals in Boldifys hair growth stimulating thickening shampoo work in unison - REMOVING DHT (the ROOT CAUSE of HAIR LOSS), absorbing excess oil, then balancing moisture for a healthy, clean feeling scalp that's prepped for regrowth - The ultimate hair thickener for thicker hair. NOURISHES, STRENGTHENS, FORTIFIES & SILKENS: Hair damaged by other hair loss shampoo products? BOLDIFY'S biotin thickening shampoo complex promotes hair restoration from the inside out, fortifying it more and more with every use - for stronger, softer, silkier hair that shines all day - without damaging hair - One of the bes thinning hair products for women and men. PREMIUM VALUE - STYLIST CREATED, COLOR SAFE FORMULA - What makes BOLDIFY volume shampoo such an incredible value? Because you're getting a full bottle of salon quality, stylist designed, sulfate free mens and womens shampoo for hair volume - for less than half the cost of one salon treatment! RESULTS GUARANTEED - 100% USA MADE - NO HARMFUL CHEMICALS: We craft every hair loss shampoo formulation in our USA, GMP, FDA approved lab - without Paraben, Alcohol or Sulfate - and we never test on animals. Rest assured you'll see results from this PURE, POTENT, SAFE hair thickener shampoo for women and men or we'll refund you every penny - no questions asked. If you need instant results, this Boldify shampoo might be the best volume shampoo for you. It delivers near-instant results, even after the first wash. You will be able to feel extra volume and thickness right away. It is packed with natural minerals and nutrients to promote healthy hair growth. If you have oily hair, this shampoo will also remove that from your scalp. 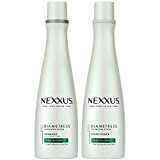 The shampoo contains rosemary and aloe extracts that help reduce hair loss. This is a sulfate-free shampoo that is safe to use on colored or dyed hair as well. Argan is a component that you will frequently encounter on our list of the best volume shampoo brands. This is an oil extracted from a Moroccan tree, and has been traditionally used in cosmetic products for hundreds of years. Along with argan oil, this shampoo also contains natural ingredients like lavender, bladderwrack seaweed, and barley protein extracts. The shampoo is available in four different formulations. Bladderwrack seaweed is a key ingredient that enriches and nourishes your hair with amino acids. This is a cruelty-free product made from all-natural ingredients. It's a 10 Haircare Miracle Volumizing Shampoo Sulfate Free, 10 fl. oz. Though it’s only number five on our list, It’s a 10 is an excellent volume shampoo. It has a healthy, sulfate-free formula that nourishes and adds a bouncy texture to your hair. This shampoo doesn’t weigh down your hair, even if you use it continuously over a long period of time. It also helps your hair hold color for an extended period. The lather is quite thick, and you only need a small quantity of shampoo at one time. If you have a sensitive scalp, this is an excellent choice. It also smells quite pleasant. If you have limp or damaged hair, this shampoo can act as a potent restorative. It has a patented formula that can penetrate and heal damaged hair from the inside. It thickens and strengthens your hair, while adding much-needed volume to it. This luxurious shampoo also has a gentle cleansing effect on your hair and scalp. It adds generous amounts of healthy shine to your hair, from the roots all the way to the tips. 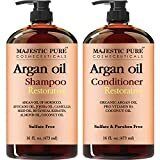 As far as the ingredients are concerned, this is a shampoo that contains potent yet safe compounds, so you can expect quick volumizing results. This is a salon-crafted shampoo that helps add volume to fine and flat hair. It uses green tea extracts and concentrated protein (elastin). The formula nourishes and thickens individual hair strands, adding to the overall volume of your hair. This process doesn’t weigh down your hair, but instead creates a fuller body and look. To accentuate the volumizing effect, you can use a volume conditioner after washing off this shampoo. Even though this shampoo does contain sulfates, it does not contain any parabens. This shampoo contains a blend of natural oils like argan oil, avocado oil, almond oil, coconut oil, camellia seed oil, and jojoba oil. As the branding suggests, authentic Moroccan argan oil is the main ingredient in this healing and volumizing shampoo. This shampoo is safe to use on all hair types, including color-treated locks. It does not contain any sulfates, and is certified cruelty-free. The formula includes an abundance of natural carotene, vitamins, and essential fatty acids. It has a very soothing effect on your hair and scalp. Deeply Moisturizing : This powerful moisturizer will wash away all of the excess oils and dirt from your hair to get that beautiful shiny hair. This shampoo set will leave you with no grease and no residue. This is simply the best volume shampoo based on sales figures and user reviews. It is a gentle shampoo that can add a lot of life and volume to dull and limp hair. If you have dry or damaged hair, the argan oil in this shampoo will provide deep hydration and nourishment. The shampoo also contains jojoba, peach, and avocado oils, for extra moisturization and hair growth. This is a 100% natural product, free of parabens and animal testing. It reduces frizz, making your hair fuller and more manageable. The scent is also quite alluring. Natural oils like argan and jojoba are in vogue when it comes to the best volume shampoo brands. We have tried to keep shampoos that use chemicals to a minimum in our list. Did you like the brands featured here? 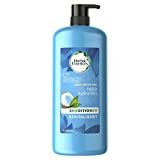 Do you have any suggestions for other best volume shampoo brands that you feel deserve mention here? If so, let us know in the comments section below.